To serve Saskatchewan by gathering, interpreting and distributing standardized information on the ecological status of provincial wild species and communities. In 1992, the Saskatchewan Conservation Data Centre (SKCDC) was formed as a co-operative venture between the Province of Saskatchewan (Saskatchewan Ministry of the Environment), The Nature Conservancy (U.S.A.) and The Nature Conservancy of Canada. The Ministry of Environment provided logistic support including office space and staffed positions; The Nature Conservancy provided technical support including methodology and technology, and; The Nature Conservancy of Canada provided fundraising support and financial oversight. Since 1995, the SKCDC has been managed as a partnership between the Province of Saskatchewan and Nature Saskatchewan. The SKCDC now resides in the Fish, Wildlife and Lands Branch of the Saskatchewan Ministry of Environment. Staff are a complement of Ministry, Nature Saskatchewan, Nature Conservancy of Canada and Native Plant Society of Saskatchewan employees. The SKCDC continues to be a member of NatureServe and its affiliate, NatureServe Canada. The NatureServe Network consists of programs, similar to the SKCDC, in all of the Canadian provinces and territories, in all 50 American states as well as in a number of Latin and South American countries. 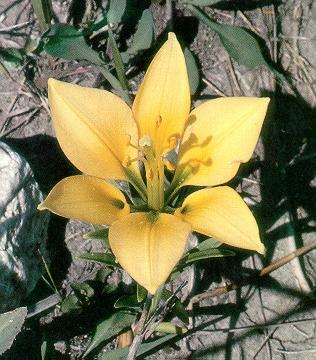 The SKCDC logo is the Yellow Immaculate Lily, (Lilium philadelphicum var. andinum forma immaculata). This is a very rare form of the provincial emblem characterized by lemon-yellow flowers, devoid of the usual dark spots. It is known to occur at only a few locations in Manitoba and Alberta each and less than 10 locations in Saskatchewan. This particular form is considered critically imperiled globally. There is some evidence that this form exists through some of the Plains and Midwest states as well.